...how many (other) studies can you think of where someone staked out a controversial position and convinced the skeptics based on empirical analysis? I think it can be done, but it's rare. And in today's world, most of the interesting empirical claims are being made in cases where� the data are too incomplete and the issue is so complex that we can't move to a consensus. The empirical work doesn't improve our understanding of what's going on. It masks what's going on. It gives a patina of science when in effect the numbers aren't really informing the debate. The whole short piece is here. Indeed, the fact that something is measurable does not render it meaningful, and not everything that is meaningful is measurable. Economics is, of course, a "social science" and not hard science. We recently posted Data Mining and Junk Science in which we discuss some of the limits and misuses of the harder sciences. Scientists know that all data is provisional and deserves skepticism, that most theories have a finite life span, and that capital "T" Truth is more of a metaphysical�or religious concept than it is the subject of math and science. Photo: Those�of us who are my age remember these nifty�tools well. 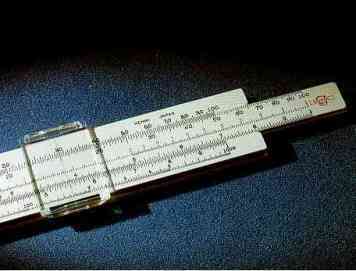 To the youngsters: that is a slide rule. I have and have used an old K&E log-log decitrig sliderule, and it is a joy of engineering. A hand-down from my father when he switched to calculators, it proved to be the perfect tool for chemistry and physics exams... by the time I hit high school calculators had been nixed from exams, but slide rules? Ahhhh... the joy of whipping through complex molarity equations in a minute or two! There is, literally, nothing faster and generating proportions than a slide-rule. Hands-down it is the best tool for that work... the time it takes someone to type in numbers and such for a calculation is huge compared to shifting the rule and moving the slide. There is a wonderful thing to go with the idea that one can generate up a theory from numbers: it is the 'theory and practice conundrum'. Numbers and lovely data don't really tell you much without a framework. Newton's laws of motions worked very well for most things (save the three body problem) and the orbital motions with perturbations really did well except for one little problem: Mercury did not follow the law. Also problems started to show up at 0.5c. Then there was all this 'atomic' and then 'sub-atomic' business that it didn't do much for, either. Suddenly the wonderful theory had so many problems and add-ons and little exceptions that it became obvious that something else was going on. Science does not start with perfect theory: it starts with the problems with a theory. Any new theory must incorporate all the old, known material and also give a working and sustainable framework for all the problems of existing theories. Thus a theory must have the ability to not only predict but to be falsifiable, that is there must be conditions that, if found, will falsify the theory. Therefore, demonstrating something that is contrary to the theory, the theory itself falls: carbon dioxide on Earth at present concentration levels or at over 20 times the current levels will cause a 'runaway greenhouse effect' or even a 'moderate greenhouse effect'. Indeed, the levels of carbon dioxide are at historic lows for the planetary history and such are a main problem with glaciation. That said, even with higher levels of carbon dioxide there have been glacial periods in Earth's history, which then points to some other mechanism necessary to explain that. Einsteinian physics took in Newtonian physics as a sub-set of the wider theory, and gave new outlooks for things like gravity and the motion of objects above 0.5c and made predictions on those things. The orbit of Mercury is explained by 'frame dragging' due to the motion of a large mass and being in close orbit to it. Einsteinian physics, itself, breaks down at the quantum level and there are now observations about universal motion that cannot be easily explained by Relativity theory. Thus, Relativity is now fraying at the edges and gaining strange add-ons to it that really don't fit the framework of Relativity too well. Gravity doesn't appear to be working, at the large scale, is having some problems and there maybe another large-scale force that is only seen at the glactic cluster scale that were unknown in Einstein's time. Some larger theory to explain not only these observations but to also include the entirety of Einsteinian theory will need to be developed. This need not be a Grand Unified Field Theory, each of which has had problems and been falsified or given no falsifiable conditions, thus invalidating those concepts from the start. That is not to say that one can be developed, just that none have so far that explain these things we are seeing. Science is the art of asking the universe questions and trying to understand the responses. The universe does not lie, but we do seem to have our own problems with understanding what it is saying. Love your comments, Jacksonian. We are on the same page.